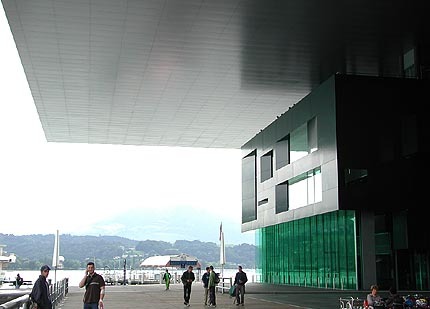 Lucerne's culture and congress center occupies a large and magnificent central site, facing onto the lake. From the lake the building is dominant but graceful, its horizontal profile and gently-sloped roof lying low beneath the mountain backdrop. From the building, the lake provides stunning views from the balcony - framed by the dramatic overhanging roof - and through the irregular windows of the main facade. 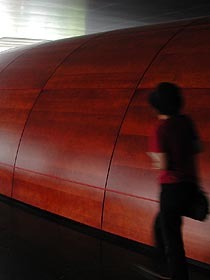 The building comprises three different spaces - a carefully acoustically-engineered concert hall, a flexible space for concerts and congresses, and an art gallery. 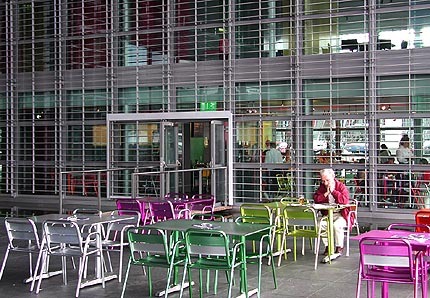 Each has a quite different character architecturally, unified only by the generous roof and the plaza it covers. 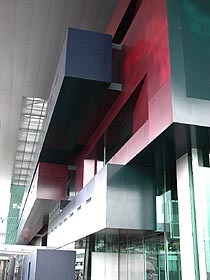 Jean Nouvel's own character is stamped all over the building: the dazzling white of the concert hall interior - a spontaneous design change part way through the project, when he had an 'aesthetic shock' at the site of the unpainted plaster acoustic tiles; the shallow canals in the atrium floor bringing the lake into the building (since permission was denied to build the building over the lake), which are hard to distinguish from the surrounding polished stone in the dim light, and into which concert-goers have inadvertently stepped; or the over-generous window panes that are so large as to be unsafe, with security guards stationed to prevent concert-goers from leaning on them. The Culture and Congress Center is right next to Lucerne train station (on your right and un-missable as you come out of the station). +41 41 226 7070 or email info@kkl-luzern.ch. The Center keeps an unsuitably ugly and uninformative web site at www.kkl-luzern.ch.